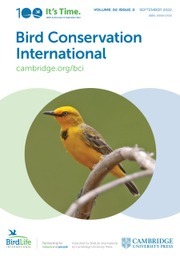 Bird Conservation International is a quarterly peer-reviewed journal that seeks to promote worldwide research and action for the conservation of birds and the habitats upon which they depend. The official journal of BirdLife International, it provides stimulating, international and up-to-date coverage of a broad range of conservation topics, using birds to illuminate wider issues of biodiversity, conservation and sustainable resource use. It publishes original papers and reviews, including targeted articles and recommendations by leading experts. Vultures attacking livestock: a problem of vulture behavioural change or farmers’ perception?